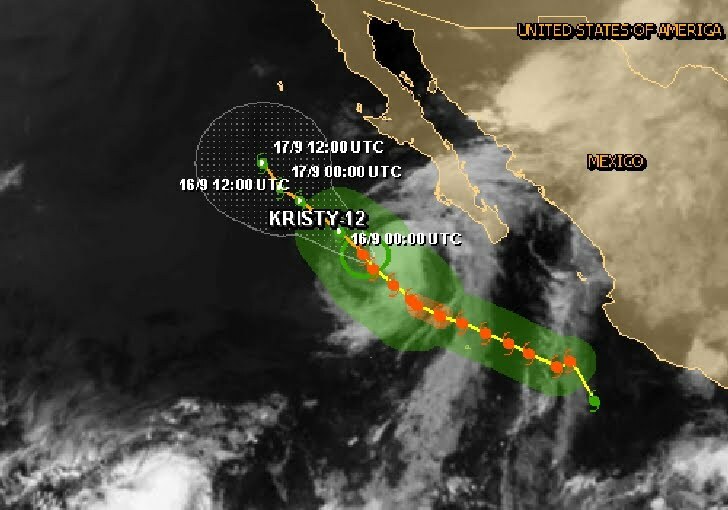 At 800 am PDT the center of Tropical Storm Kristy was located near latitude 22.4 north/longitude 115.0 west, about 525 km/ 325mi W of the southern tip of Baja California with maximum sustained winds 65 km/h - 40mph. Kristy is moving toward the northwest near 9 mph - 15 km/h and this motion is expected to continue for the next two days. Swells generated by Kristy will affect portions of southern Baja California during the next day or two. These swells could cause life-threatening surf and rip current conditions. On a local note: at 12:00 noon we have 33 degrees Celsius with blue sky and sunshine in La Paz. Not even remote signs of a tropical thunderstorm.